We have some major news about the future of Left Turn. We have published the final issue of our print publication. This decision did not come easily, but in the end we felt we had no choice. We are aware that we owe more than just thanks to our subscribers and sustainers. Many of you have issues remaining on your subscription. We have contacted friends and allies from various print publications who have agreed to fulfill your subscription. You will have a choice of several publications to fulfill the issues we owe you. Please see our subscription page for more details. You can also contact us with any questions regarding this at [email protected]. Although Left Turn Magazine will no longer exist as a print publication, this is not the end of Left Turn. Left Turn has always been more than just a magazine. It is a political project that emerged in the aftermath of the protests that shut down the WTO in Seattle in 1999 to provide some cohesion to the growing anti-capitalist movement and a space to address the many political issues it was facing. At the time, a print publication made the most sense. Today we are seeing the re-emergence of that movement in the Arab spring-inspired occupations across the country. The central role the internet and social media played in this new global intifada shows how much the world has changed in just the last ten years and how important it is to have a strong web presence, particularly for the alternative media. An electronic Left Turn would not only allow us to reach more people but publish more content. This is not to say that we don't see the need for continuing to have some type of print media, especially when so many people are coming together to occupy and reclaim our public spaces. Hopefully with your help we can figure out a creative and cost effective way of doing this. 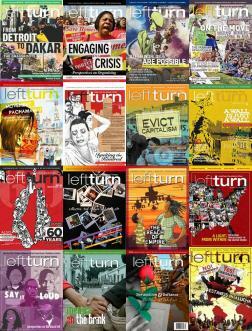 While we focus on building a more dynamic and robust web presence, we will continue featuring the news, analysis and commentary that have been the heart of Left Turn for 10 years at http://www.leftturn.org. For those who would like to see this project continue, donations are still needed. We hope that many of you will continue to stay on as sustainers or supporters, to help us in this new phase of this project. In the meantime, we hope all of you will continue to inspire us with story ideas, contributions and writings and as always, stay in touch. We are sure we will continue to see you in the streets, struggling for the better world that so many have risen up to fight for over the past year.